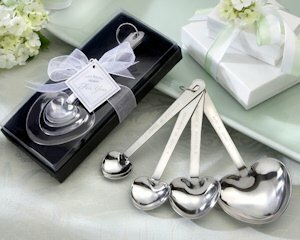 This fun and practical set of 4 stainless steel measuring spoons has both traditional measurements and measurements of love. "A Pinch of Patience" = 1/4 tsp, "A Dash of Kindness" = 1/2 tsp , "A Spoonful of Laughter" = 1 tsp, and "A Heap of Love" = 1 TBSP. The set of heart-shaped measuring spoons is presented in a velvet lined black box and a clear acetate top that measures 6" x 1 3/8" x 2 3/4". Each gift box includes a sheer white organza bow. Each spoon set also comes with an optional personalized tag. (Tags shipped separately so some assembly will be required). 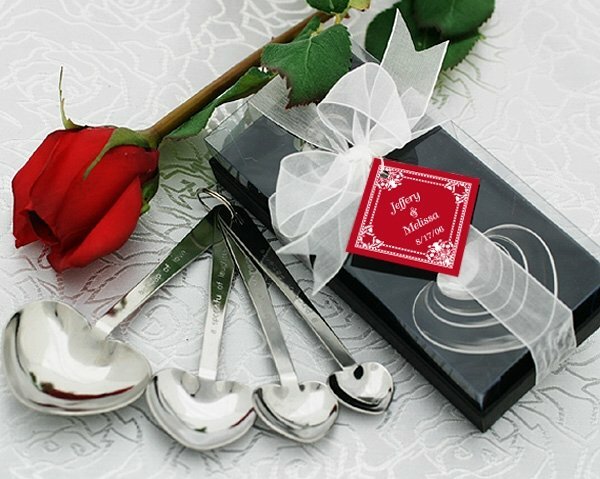 Is the “love measuring spoon” stainless steel? Yes, the practical set of 4 Love Beyond Measure' Heart Measuring Spoons are stainless steel. Why can't I seem to copy and paste my personalization? You need to use the designer tool of the 'Love Beyond Measure' Heart Measuring Spoons; just click on the 'Personalize Now' tab after adding it to your cart and it will automatically enter all the information under personalization.